The date is set for the 2019 festivities: Saturday 8th June 2019 and the theme this year will be ‘Storybook Animals’. In the weeks running up to the Gala we will again be holding our Scarecrow competition. A fun activity to do with the kids, the scarecrows attract a lot of attention with many people following the Scarecrow Trail round the village. If you would like to make one you can PRESS HERE to get an information sheet and register your scarecrow in the way described on the sheet - the scarecrow must be up by May 31st. the other is a junior award for a young person under 18 who has done ‘something really special’. These accolades are awarded by you, the residents of our village. If you know someone who deserves an award just go ahead and nominate them. The winners will be announced at the Gala. The person you nominate must be a resident of the village and you should give as much detail as you can about why you are nominating them. The forms should be handed in, in a sealed envelope, at Sandiway library by Monday May 20th. 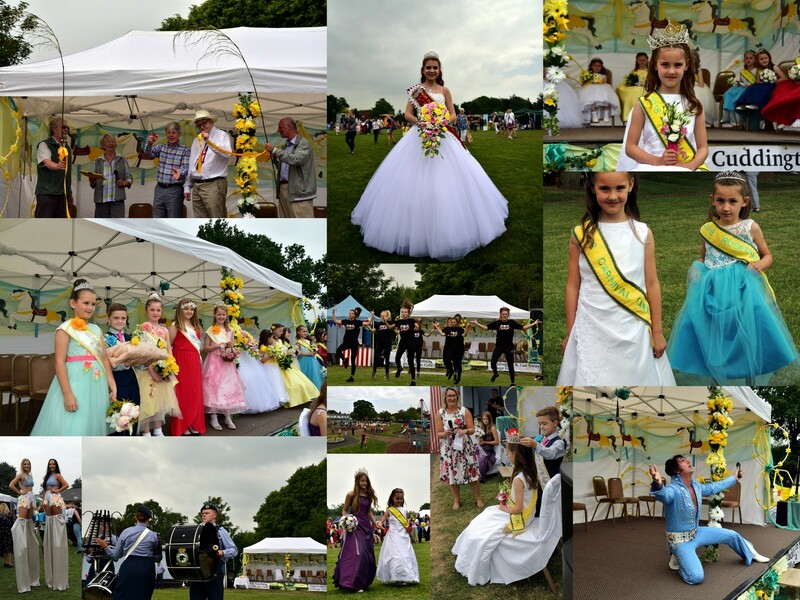 The Selection has taken place for the Royal Pageant at the 2019 Cuddington & Sandiway Gala. Our new Queen will be Scarlett Joice. Scarlett is 6 years old and attends Sandiway Primary School where her favourite subject is Art. When not at school she enjoys ballet, street dance, and roller disco. She also likes swimming. Scarlett will be raising money for the Multiple Sclerosis Society because her granddad has MS. She will be accompanied on the day by our Princess, Beatrice Macleod, aged 5, along with Empress, Alexa Rose Astles who is 6, Rosebud, Freya Macleod, 5 and Fairy Queen, Amara Grace Astles, 2. Would you like a stall at the 2019 Gala? The Gala offers a opportunity for charities and ‘not for profit’ groups to promote their cause and generate some funds. We invite you to join the exciting range of stalls offering, ‘pocket money’ toys, games, crafts and activities to entertain the children. The sun shone on our 2018 ‘Cinema’ themed gala and drew out a huge crowd, in fact the highest attendance seen on gala day in its eight years. Unfortunately this caused the beer tent to run dry! However there was plenty of non alcoholic refreshment to be had and no reason for anyone to go thirsty or hungry. In the arena people were treated to a performance of exuberant dancing by the kids from Impulse Dancers. Of course there were also the proud members of our Royal Pageant resplendent in their fabulous dresses and accompanied by visiting royalty from Northwich and Middlewich. Our very own’ Elvis’ wowed the crowd with his tribute act and the biggest choir ever to grace our stage from our 2 primary schools (in fact they didn’t even fit on the stage) put heart and soul into a rousing performance. Away from the arena it was all action with young and old alike trying to brush up on their circus skills and small goats being taken for a walk on leads. There were all the perennial favourites in the form of archery, miniature train rides, a shooting gallery and many stalls run by local charities offering fun activities to raise funds for their causes. All in all it was a gala to remember. Evie’s attendants from the left: Fairy Queen - Amy Spruce, 6. Rosebud - Freya Whittaker, 5. Empress - Isla Hubert Powell, 6. Princess - Millie Hubert Powell, 4. 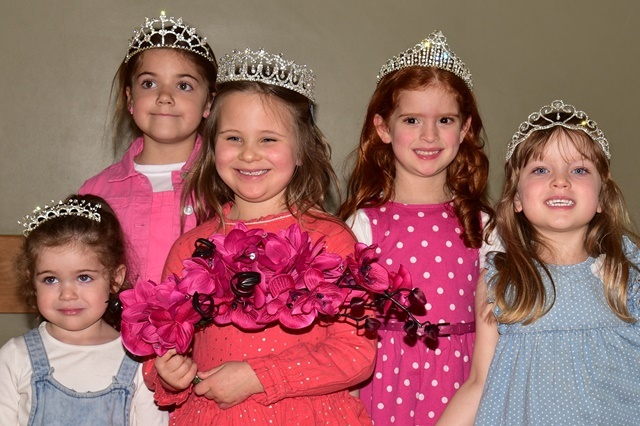 These five young ladies were looking forward to June 9th when they participated in the Gala Royalty Pageant at our 2018 gala. They attended the Selection event at the village hall where they were given their titles ready for the big day. Evie Whittaker, age 7, was chosen as our 2018 Community Queen. Evie attends Sandiway Primary School where her favourite subject is English. Her favourite hobby is rollerblading and she also enjoys gymnastics. She fundraised for the Joshua Tree. Isla Hubert Powell is our Empress. She is 6 years old and goes to Cuddington Primary School where she enjoys being with her friends. She also enjoys story writing and art and jumping on her trampoline. She raised money to Save Whales. The members of the Royal Pageant were not be the only ones to take the stage with pride on Gala Day. There was also an adult Citizen of the Year and a Junior one. They were elected by you, the residents of the village. Ken has been a member of Cuddington parish council for 45 years and this has made him an invaluable source of local knowledge and history which has greatly assisted the council. Ken is passionate about local issues and is committed to doing his best for his constituents. He has been involved in many projects in the village including the Multi Use Games Area and the Weaverham Road football field. He has supported residents views regarding new development within the village and on several occasions has been our spokesman at Planning meetings. Ken is well known for his ‘hands on’ response to helping residents, including giving lifts to hospital appointments. He has also served on the Governing Body of Cuddington Primary School and involved himself with many other organisations. Amy is very active in village life. She has been named as Most Promising Junior Member of Sandiway Pantomime Group and is very supportive and encouraging with new children joining the group. She is also a regular helper at Beavers. She is caring and thoughtful and loves to find ways of occupying her siblings and entertaining her grandparents by staging little performances for them. She has also helped with fundraising for Macmillan at a previous gala and she is involved in many after school activities. The theme for this year's competition was "CINEMA". In 2017, the "Dr Peter Chivers Award for Junior Citizen of the Year" was introduced.